Prices and exact shipment dates will be revealed during a live global press event in two weeks. Huawei has been on a hot streak with its lineup of smartphones. While its lower-end budget offerings are rather vapid, its mainstream Honor and flagship Mate series have gained traction over the years amongst users and press. The manufacturer is continuing its push into the U.S. smartphone market by introducing an official North American version of the recently released Honor 7X. Other than the announcement above, there appears to be no hardware changes on the North American Honor 7X besides the inevitable adjustments to the baseband radio to suit local wireless carriers. The full details on the Honor 7X, including its specifications and features, can be found on our existing page covering the initial reveal of the smartphone. 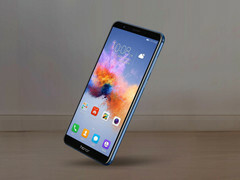 In short, users can expect the Honor 7X to be thinner (7.6 mm vs. 8.2 mm) and slightly heavier (165 g vs. 162 g) than its immediately predecessor with a change to the more elongated 18:9 screen aspect ratio. Huawei is purposefully withholding exact U.S. launch dates and prices for its latest mainstream offering. Instead, we can expect these key details to be announced during a live Honor 7X "global launch event" scheduled to take place in London on December 5th at 1:30 PM GST. Judging by its launch prices in China, however, we can expect the 32 GB and 64 GB SKUs to retail in the ballpark of 1300 CNY (~$200 to $300 USD) and 1700 CNY ($300 to $350 USD), respectively, in Gold, Blue, and Black color options.